The PLVario-II system offers significant improvements for the user. The number of participants on the internal CANopen bus has been doubled to 64. The bus frequency could be increased significantly. The energy measurement module PLVario-IIEM64 has a fourpole design. It enables the current and voltage measurement of the 3 outer conductors and the neutral conductor. Alternatively, 4x single-channel measurement is possible. For alternative current measurements, there is the PLVario II EM4R. For measurement, Rogowski PLVario-II-ROG coils are used here, which makes it easy to retrofit measurement technology. Furthermore, SASILplus strips with integrated measuring technology EE07 can be connected to the system. New here is the implementation of a 4-pole variant with N-conductor current measurement*. To evaluate further process information, the PLVario II I/O is available. Digital inputs and outputs, analog inputs and tempreature inputs can be connected here and freely parameterized. The central data logger is PLVario II-NET. The use of the latest processor technology ensures future-proof operation. Via touch display, the user can visualize and parameterize the system comfortable at the PLVario II-PNL. No software is necessary for this. 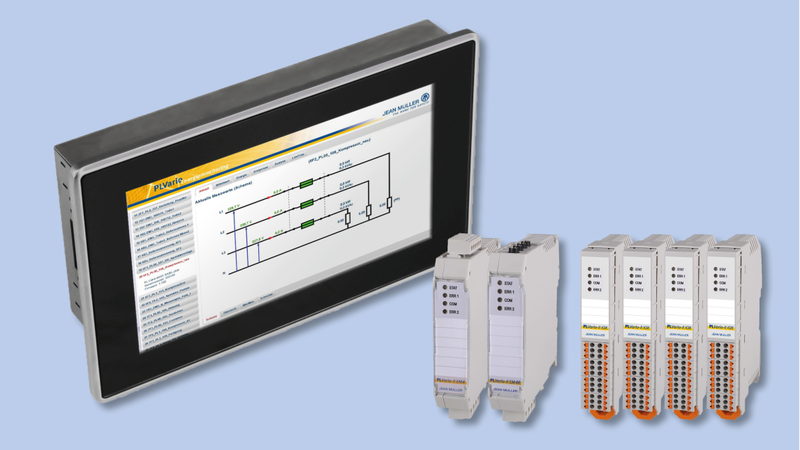 The integrated Modbus/Master makes it possible to implement different Modbus slave stations. These include the PLMulti II, PLOcto but also Modbus slave devices from other manufacturers. An integration of the fuse switch-disconnectors SL is planned. The system components PLVario-I are compatible with PLVario-II.